In the evening, when I was in my cell I saw he Lord Jesus clothed in a white garment. One hand was raised in the gesture of blessing, the other was touching the garment at the breast. From beneath the garment, slightly drawn aside at the breast, there were emanating two large rays, one red, the other pale (…) After a while, Jesus said to me: ‚Paint an image according to the pattern you see: with the signature: Jesus, I trust in You’. I desire that this image be venerated, first in your chapel and [then]throughout the world. [Diary 47]. Thus, the image was painted because Jesus Himself had desired that. 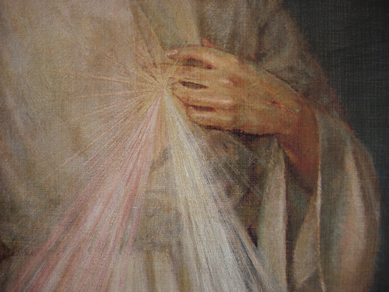 The picture is both a sign and a visual synthesis of the whole Divine Mercy message, which He conveyed by Sister Faustina: on the one hand it reminds us of the mystery of God’s merciful love for man revealed in the Holy Scriptures, it exhorts us to form the Christian attitude of trust towards Him and mercy towards neighbour and, on the other hand, it is a vessel for drawing graces to which He attached many promises. 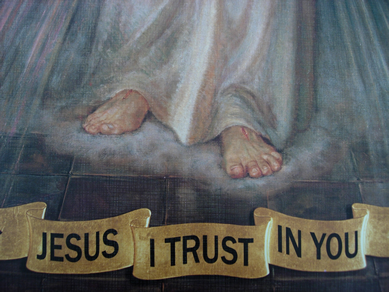 A general promise of all possible graces and rewards in this world (provided that they are in accordance with God’s will) as well as specific promises: the grace of eternal salvation, great progress on the path of Christian perfection and the grace of peaceful death – these are the promises Jesus attached to a prayer said in front of the image on condition that it is said with trust and that it is conjoined to deeds of mercy towards neighbour. 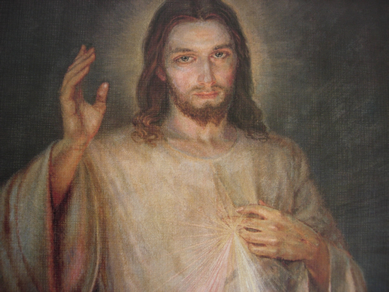 In 1934 the first image of the Divine Mercy was painted under Sister Faustina’s direction in the studio of a Vilnius artist, Eugeniusz Kazimirowski. 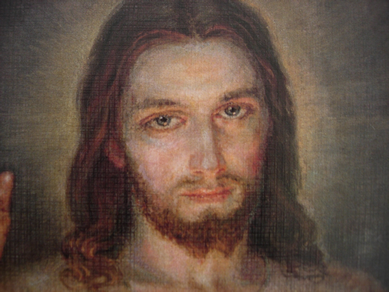 Since that time many different versions of the image of the Merciful Christ according to Sister Faustina’s vision have been painted. They can be found in churches and chapels all over the world. 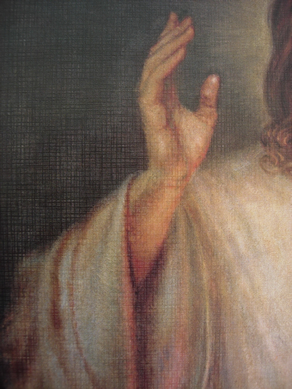 The picture which is displayed in the convent chapel of the Congregation of the Sisters of Our Lady of Mercy in the Shrine of the Divine Mercy in Cracow-Łagiewniki and which is renowned for the graces received by means of it, holds a special place in this iconography and in the Divine Mercy devotion: although it is neither the first picture painted under Sister Faustina’s direction nor the first image displayed in the chapels of her Congregation, Jesus’s will: I desire that this image be venerated, first in your chapel, and [then] throughout the world (Diary 47) has been fulfilled by means of this picture. This image of Christ is greatly honoured by the faithful, it is renowned for many graces and its copies as well as reproductions can be found everywhere, on all the continents. The Feast of Mercy is celebrated on the first Sunday after Easter, that is on the Second Sunday of Easter, which is called the Divine Mercy Sunday today. Cardinal Franciszek Macharski was the first one to make it part of the liturgical calendar of the Archdiocese of Cracow (1985) and, later, some Polish bishops instituted the feast in their dioceses. In 1995, at the request of the Polish Episcopal Conference, Holy Father John Paul II instituted the feast in all dioceses in Poland. On the day of Sister Faustina’s canonization, 30th April 2000, the Pope instituted the feast for the whole Church. I desire that the first Sunday after Easter be the Feast of Mercy (Diary 299). I desire that the Feast of Mercy be a refuge and shelter for all souls, and especially for poor sinners. On that day the very depths of My tender Mercy are open. I pour out a whole ocean of graces upon those souls who approach the Fount of My Mercy. The soul that will go to Confession and receive Holy Communion shall obtain complete forgiveness of sins and punishment. On that day all the divine floodgates through which graces flow are opened (Diary 699). The Feast of My Mercy has issued forth from My very depths for the consolation of the whole world (Diary 1517). I believe in God, the Father Almighty, Creator of heaven and earth; and in Jesus Christ, His only Son, our Lord; who was conceived by the Holy Spirit, born of the Virgin Mary, suffered under Pontius Pilate, was crucified, died, and was buried. He descended into hell; the third day He arose again from the dead; He ascended into heaven, sits at the right hand of God, the Father Almighty; from thence He shall come to judge the living and the dead. I believe in the Holy Spirit, the Holy Catholic Church, the communion of saints, the forgiveness of sins, the resurrection of the body, and life everlasting. Amen. “At three o’clock implore My mercy, especially for sinners; and, if only for a brief moment, immerse yourself in My Passion, particularly in My abandonment at the moment of agony. This is the hour of great mercy for the whole world” (Diary 1320). Immediately, it needs to be explained that what is meant here is not sixty minutes but the moment of Jesus’ agony on the cross, therefore – the prayer at 3pm. The Lord Jesus did not say what the exact wording of the prayer at 3pm should be, however, He said that we can make the Stations of the Cross, visit the Blessed Sacrament and if there is no time for it – if only for a brief moment – we can unite ourselves with Him, dying on the cross, wherever we happen to be at that time. The subject-matter of the prayer is the mystery of the Lord’s Passion. The prayer said at the Hour of Mercy should meet specific conditions, namely, it should be said at 3 p.m. (when the clock strikes the hour), it should be addressed to Jesus directly and in its entreaties the prayer should refer to the values and merits of His sorrowful passion. It is frequently written and said that the Chaplet to the Divine Mercy must be said at 3 pm and that the Chaplet said at that time has a special power. It is thought so due to lack of knowledge of the devotion to the Divine Mercy in the forms conveyed by Sister Faustina and maybe due to the need for a ready-made wording of the prayer. 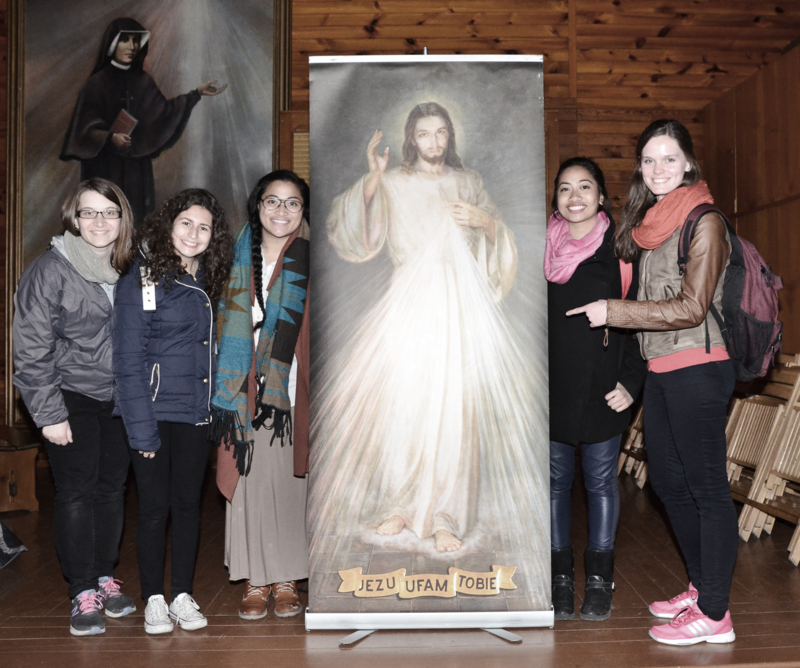 The prayer at the Hour of Mercy is a separate form of devotion to the Divine Mercy. Jesus associated a specific promise with it and He also said how it should be said. He never mentioned that the Chaplet to the Divine Mercy should be said at that hour. Certainly, at 3pm we can say the Chaplet, as at any other hour during the day and night, however then we do not say the prayer at the Hour of Mercy (but we say the Chaplet). The Chaplet to the Divine Mercy cannot be the prayer at the Hour of Mercy because it is directed to God the Father (Eternal father, I offer you…), and the prayer at the Hour of Mercy is to be addressed to Jesus directly. The prayer at the Hour of Mercy when said regularly makes us start having a personal, direct contact with Jesus because it tells us to: meditate upon His Mercy revealed in the Passion, address to Him in a direct manner, like to a very close person, and, it tells us, for the sake of the merits of His Passion, to entreat Him for the graces necessary for us and the world. It is up to us whether at 3pm we want to practice the prayer at the Hour of Mercy or to say the Chaplet to the Divine Mercy. While telling others about the devotion to the Divine Mercy and while practicing it, this should be stated clearly and the Chaplet should not be confused with the Hour of Mercy. Souls who spread the honor of My mercy I shield through their entire lives as a tender mother her infant, and at the hour of death I will not be a Judge for them, but the Merciful Saviour (Diary 1075). Hardened sinners will repent on hearing their words when they speak about My unfathomable mercy, about the compassion I have for them in My Heart. To priests who proclaim and extol My mercy, I will give wondrous power; I will anoint their words and touch the hearts of those to whom they will speak (Diary 1521). These promises show how important it is to spread the honour of the Divine Mercy since Jesus promises His maternal care, during the lifetime and at the hour of death, to everyone who will undertake this task. Therefore, apart from the Image, Feast, Chaplet and Hour of Mercy, spreading honor of the Divine Mercy is also a form of the Devotion, because Jesus also attached promises to it and the promises pertain to all people. Secretary of My mercy, write, tell souls about this great mercy of Mine, because the awful day, the day of My justice, is near (Diary 965). Do not tire of proclaiming My mercy (Diary 1521). Tell the whole world about My inconceivable mercy (Diary 699). Let all mankind recognize My unfathomable mercy. It is a sign for the end times; after it will come the day of justice (Diary 848). Write: before I come as a just Judge, I first open wide the door of My mercy. He who refuses to pass through the door of My mercy must pass through the door of My justice (Diary 1146). Therefore, the Lord Jesus’ urgent call directed to Sister Faustina and, through her, to the entire Church and the whole world, can be found so many times in the ‘Diary’. The hour has come when the message of Divine Mercy is able to fill hearts with hope and to become the spark of a new civilization: the civilization of love.